Fast-food workers protest in Chicago on Sept. 4, 2014, as part of a country-wide push for a $15 hourly wage. 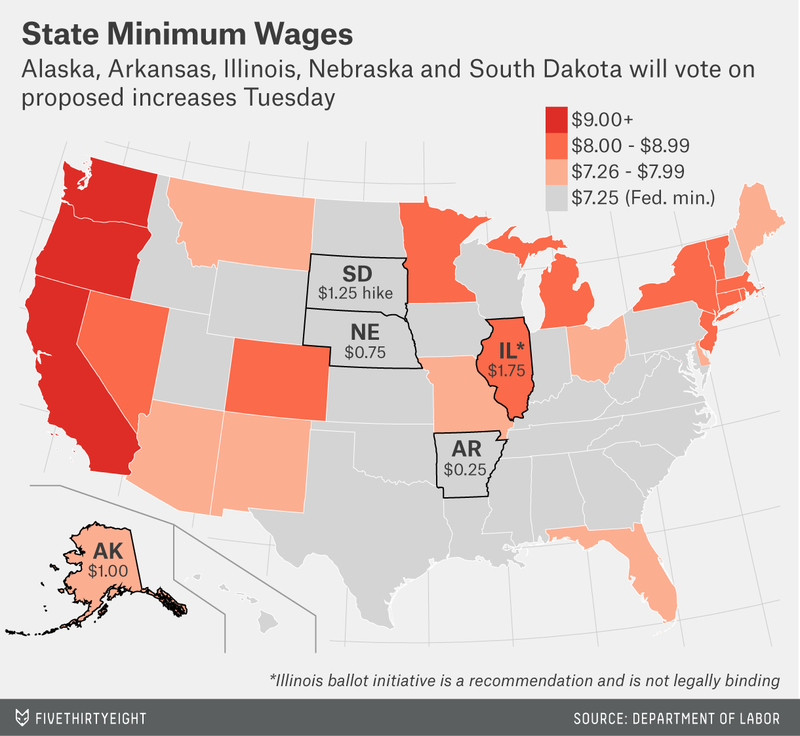 Voters in five states — Alaska, Arkansas, Illinois, Nebraska and South Dakota — will decide on ballot initiatives proposing an increase in the states’ minimum wages. Four of the initiatives would be binding; in Illinois, the ballot measure is only advisory. Efforts to raise the federal minimum wage have foundered, but have made progress at the state and local level. Several states, including California and New York, have passed legislation to increase their minimum wages in recent years. The city of SeaTac, Washington, last year voted to increase its to $15 an hour, the highest in the country; nearby Seattle this year decided to follow suit, although it will phase in its increase gradually over seven years. Whatever the economic impacts, the minimum wage remains a popular issue. Polls consistently show that a large majority of Americans favor raising it, and Democrats are clearly hoping the issue will help bring voters to the polls, both in states with ballot initiatives and in states like Wisconsin where the minimum wage has been an issue in the gubernatorial campaign. Beyond politics, however, Tuesday’s votes carry real-world implications for hundreds of thousands of low-wage workers. If all five initiatives pass, and if the Illinois legislature acts in accordance with voters’ wishes, about 680,000 workers would get a raise, according to data from the Current Population Survey. Their median age is 28. Two-thirds are women. A quarter are raising children. Proposal: Raise minimum wage to $8.75 on Jan. 1, 2015, and $9.75 on Jan. 1, 2016. After that, minimum wage is adjusted based on inflation or $1 above the federal level, whichever is greater. Alaska has one of the country’s highest costs of living — it has to import an unusually large share of its goods — but has a minimum wage that’s only 50 cents an hour above the federal minimum. (Other high-cost states such as New York, New Jersey and California have higher state minimum wages.) Perhaps as a result, most Alaska employers already pay more than the minimum wage: Just 1 percent of hourly workers earn minimum wage, one of the lowest shares in the country. That would change if Tuesday’s ballot initiative passes; nearly 5 percent of hourly workers would get a raise under the policy, and the wage would continue to rise — and stay above the federal level — in the years ahead. Proposal: Raise minimum wage to $7.50 on Jan. 1, 2015, $8 on Jan. 1, 2016, and $8.50 on Jan. 1, 2017. Arkansas’s proposed wage increase is the smallest of any state, and would affect the smallest share of workers. The ones who would get a raise, however, look different demographically than those in other states. Their median age is 34, by far the oldest of the five states with ballot initiatives, and 40 percent have children, far more than in other states. The notion that low-wage workers are mostly teenagers is wrong across the country, but in Arkansas it’s even more off base. The typical low-wage worker in Arkansas is a 30-something, unmarried woman with no more than a high school education. Proposal: Non-binding advisory question on raising minimum wage to $10 by Jan. 1, 2015. Illinois is an outlier in this group in several ways. Its ballot measure, unlike the others, isn’t binding. It’s also much more radical — if enacted as proposed, the minimum wage would immediately become the highest of any state in the country. (Washington now has the highest state minimum wage, at $9.32 an hour.) Nearly a fifth of hourly workers in the state earn less than $10 an hour, meaning they’d be due for an overnight raise under the proposal. Illinois Gov. Pat Quinn’s original bill — which failed in the legislature — would have raised the wage to $10 more gradually, over three years; if legislators take up the idea again following Tuesday’s vote, it seems likely they would again push for a phased-in approach. Proposal: Raise minimum wage to $8 on Jan. 1, 2015, and $9 on Jan. 1, 2016. A strong state economy means relatively few Nebraskans are trying to subsist on the minimum wage. Less than 6 percent of hourly workers earn less than $8 an hour, and most who do are young, part-time workers. The median age of the 33,000 workers who’d be affected by the increase is 20, and more than three quarters work less than 35 hours a week. Few are married or have children, and many of them are enrolled in school. South Dakota’s proposal is the most aggressive of the four binding ballot initiatives, raising the state’s minimum wage by $1.25 all at once. Perhaps not coincidentally, the state is also in the best economic shape. Aided by a strong agricultural sector and a drilling boom across the border, South Dakota’s unemployment rate is among the country’s lowest. As in Nebraska, South Dakota’s low-wage workers tend to be relatively young part-timers. But not all of them: More than 1,000 single mothers in South Dakota are raising children on less than $8.50 an hour. CORRECTION (Oct. 30, 12:10 p.m.): A previous version of this article included graphics that showed Illinois proposing a $1 wage hike. It would be a $1.75 increase. The labor-backed “Fight for $15” movement has mostly focused on getting fast food chains and other low-wage employers to raise workers’ pay, rather than on raising the government-mandated minimum wage. The estimates are based on data from the Current Population Survey. They are full-year averages for the 12 months ending in September 2014. In all cases, I’m including only workers who are paid by the hour. Some salaried workers would also see a raise if the minimum wage were increased, but they’re difficult to identify reliably in the CPS data, so I’m excluding them. Tipped workers such as waiters and waitresses are generally subject to a lower minimum wage. (In theory, if their wages plus tips don’t bring them up to the normal minimum wage, their employer is meant to make up the difference. In practice, this is difficult to enforce.) The CPS doesn’t collect reliable data on tips, so I’m excluding from my analysis people who currently make less than their state’s current minimum wage. The wage and hour data in the Current Population Survey is all self-reported. Not all workers report their wages, and some of those who do likely round or otherwise misreport their hourly pay. The estimates are also subject to sampling error, particularly in smaller states such as Alaska and Arkansas. Finally, a note on sources: A list of current state minimum wages is available from the Department of Labor. (I’m applying the current minimum wage for the entire 12-month period, even if states have increased their wages during that time.) Details on state ballot initiatives are via Ballotpedia. The Bureau of Labor Statistics publishes annual data on minimum-wage workers, but only relative to the federal minimum wage. This is the number of workers who currently earn less than the proposed new minimum wage. In cases where the wage would be raised in stages, this is the number of people earning less than the minimum after the initial increase. Arkansas’s state minimum wage is technically $6.25, but it is superseded by the federal minimum.